Giving Back…Supporting our Wake Forest Community! It’s that time of the year when the wheels on the bus go 'round and 'round! Yes, the school buses are out and it’s back to school for the grandkids. 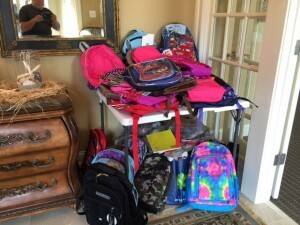 This year the Villas of Wake Forest celebrated their 4th Annual “Back to School Backpack Drive ”. The homeowners at the Villas of Wake Forest believe in giving back to their local community. “Our contributions and volunteer efforts help create stronger ties within our community with the goal of providing a better life for those that live in the greater Wake Forest community." says Marlene Barnes, one of the members of The Villas Social Committee that leads this community volunteer effort and others throughout the year. Over 25 Backpacks were Collected in Wake Forest this year! Friday's dinner to end the drive! This year over 25 backpacks were collected, the biggest year ever! 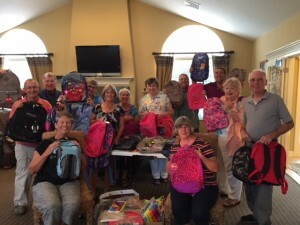 The backpacks and supplies were donated to Hope House of Wake Forest, a non-profit youth ministry sponsored by the local Friendship Chapel Baptist Church. At the Villas, residents take their responsibility to be good neighbors seriously. They don’t just look out for each other; they look out for their community at large. Throughout the year they hold a variety of charity events that benefit those in need in the Wake Forest region. For instance, they hold at least two to three small food drives during the year and a really big food drive at Thanksgiving. These are done in partnership with the Wake Forest Food Bank which benefits families facing food insecurity throughout the year in Wake Forest area. The Social Committee also holds a toy drive for the Holidays for area families. 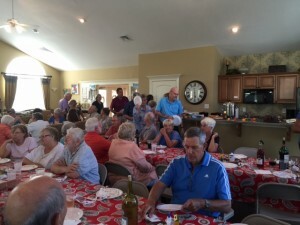 So, after everyone worked diligently for the week to gather as many school supplies as possible, the homeowners culminated their efforts with a special dinner at the Villas of Wake Forest Clubhouse to pack the bags with the supplies and get them ready to go to Hope House. This close-knit group enjoys an amazing camaraderie, taking care of each other and having fun, while helping those outside their circles. This special group of people make The Villas a special place to live!